Of course, that’s only the first step: being a word problem, it typically requires you to perform additional steps to arrive at the answer. Decipher — Read the problem and the answers carefully and write down what you know and need to figure out. Decide — Figure out what you need to do or what steps you need to take to find the answer. Do — Do the math and identify the correct answer. Alvin is always lost because he has no sense of direction and pays no attention to where he is going. After class on Tuesday, Alvin’s buddy invites him over to prepare for the science test the next morning. He tells Alvin to walk 3 blocks north and 4 blocks west after he leaves the bus and look for 388 on a red brick house. 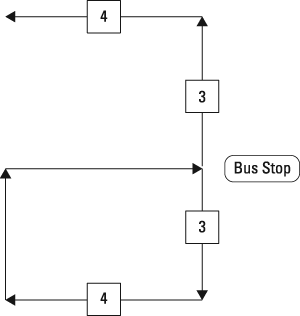 When Alvin leaves the bus, he walks 3 blocks south and 4 blocks west. Realizing he is completely lost, he starts asking passers-by for directions to the bus stop, hoping he can find his friend’s house from there. A good-hearted elderly man walks him the 3 blocks north and 4 blocks east to get back to the bus stop. He then walks Alvin to his friend’s house and leaves Alvin with a comment that Alvin makes him feel young again. How many extra blocks did Alvin walk? Pedro works in sales. He compares his commissions for the four-week period when bonuses were being given and finds that he has earned an average of $424.50 per week for the four weeks. He earned $485.00 the first week, $257.00 the second week, $410.00 the third week, and $546.00 the final week. Pedro’s company offered sales staff an incentive bonus of 15% for each week their commissions exceeded $475.00. How much did he earn in dollars that four-week period, including commissions and bonuses? Assuming the streets run parallel, Alvin would have traveled 3 + 4 + 3 + 4 + 3 + 4 = 21 blocks instead of the 7 blocks he would have had to travel. He traveled 14 extra blocks. Pedro earned $485.00 the first week, $257.00 the second week, $410.00 the third week, and $546.00 the fourth week. If the bonus is paid for weeks when his commissions exceeded $475.00, he would have earned bonuses for the first and fourth week. His bonus the first week is ($485.00) (0.15) = $72.75 and the fourth week is ($546.00) (0.15) = $81.90. His earnings for the four-week period = $485.00 + $257.00 + $410.00 + $546.00 + $72.75 + $81.90 = $1,852.65.